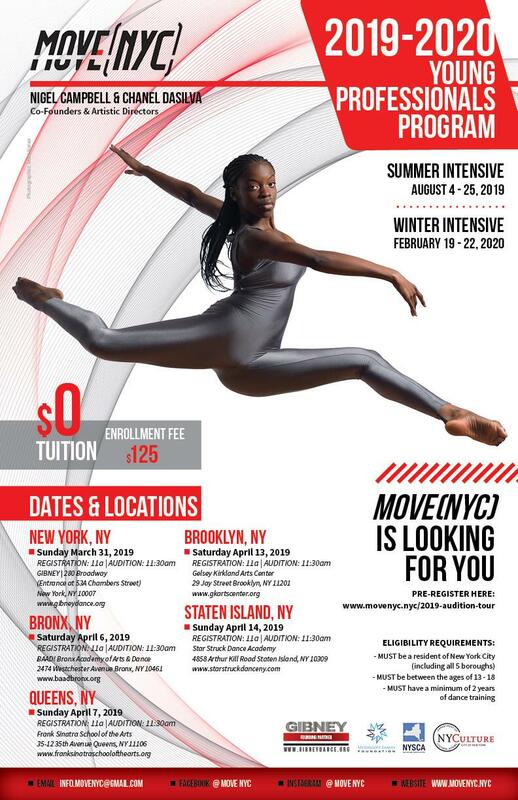 MOVE(NYC) 2019-2020 Young Professionals Program auditions!! Students may attend any one of the 5 auditions in whichever borough is convenient for the student. However, we ask that each student only audition ONCE. Returning auditionees will not be allowed to audition again once they have already been seen by the audition panel. Thank you for your cooperation. Space is limited for each borough's audition. To ensure your spot to audition in the borough of your preference we highly recommend that you pre-register. PRE-REGISTRATION CLOSES 5 DAYS PRIOR TO EACH AUDITION. WALK-IN APPLICANTS WILL STILL BE ACCEPTED.